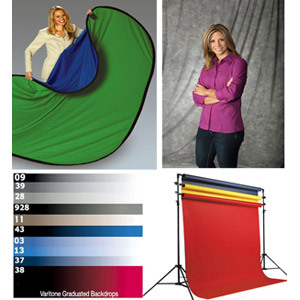 We're the original manufacturers of the V-Drape in the United States. • One of the original manufacturers of the V-Drape in the United States. • Drapes are custom made with quality Black Velvet and feature a V neck with a Velcro closure in back. • Help your seniors feel more secure under our Velvet Drapes with a Tube Top cover. 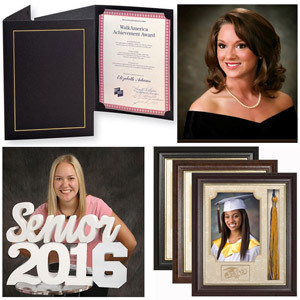 Photo Gallery Photo Folios are a padded bonded leatherette black cover and display 4, 6, 8 or 12 photos. 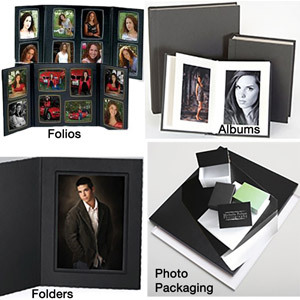 • Photo Folios feature a multiple set of photos in a variety of configurations. • Each Photo Gallery holder have a unique variety of vertical, horizontal and oval openings with different pinstripes around each image. • PLEASE see the ''More Images'' link under the photo for the style choices. PRESS THIS BOX FOR MORE DETAILS, SIZES & PRICES! Panoramic Photo Frames for a large format photo are simple and economically price. • Black wood photo frames display your sports team, landscape or special image. • Each Panoramic Photo Frame is individually boxed for protection. • ALL Frames have a light-weight plexiglass cover, not glass! PLEASE PRESS MORE DETAILS TO SEE SIZES/PRICES! Sports Photo Memory Mate, Play Hard have two photos and a sports motif. 1 - 7" x 5" "team" photo and 1 - 3 1/2" x 5" "individual" photo. • They're great for sports teams, summer camp, sports clubs, school sports, etc. • Photos load easily from the side and stay firmly in place. • A pop-out easel holds your vertical framed prints. • Outside size is 8 x 10 for framing if desired. Sold in packages of 100 Memory Mates. PLEASE PRESS MORE DETAILS TO SEE OPTIONS/PRICES! • A complete photo kit for creating a personal set of digital backgrounds with a green screen. • This package includes the BEST software, PLUS, digital background DVD and overlays! • Works on Windows® or Macintosh® computers. Each SM Sports Photo Memory Mate for the most popular sports. • Traditionally used for little league teams, sports camps, sports clubs, school sports. 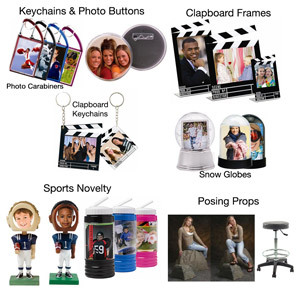 • Each display holds 1 - 7" x 5" "team" image and 1 - 3 1/2" x 5" "individual" photo. • Black & White Memory Mate frame with ball motif on the side panel. • A simple flexible easel on back displays your sports team. • The outside frame measures 8 x 10 for placing in a frame. Sold here in paks of 100. For an economical and archival way to store and present your photos! • Insert your photo, peel adhesive lip, and re-seal the top. • Archival material that won't rip or tear like other plastic bags. • Bags are 1.6 Mil thick. Archival safe bag will hold between 1 to 20 photographs of varying sizes. An economical way to present portrait images. • Envelope show your photographic prints through the window. • Full View window to show off your photographs. PLEASE PRESS HERE TO SEE SPECIFIC SIZES/PRICES! • The NEWEST technology in LED lighting for still & video! • The LED 50 watt lamps put out as much light as a 500 watt photofloods! • The Cool 50 watt light has none of the heat and generates a 5200˚ K light color temp. • The LED is rated at 50,000 hours without burning out. • Built in dimmer allows for adjustments to your specific needs. • Also, an optional battery pack to run any on DC power! • This kit only comes with 4 lamps but room to add 4 more! PLEASE PRESS MORE DETAILS TO SEE DETAILS! • 110V AC powered or an 12V DC battery pack option. • Two 300WS digital flash heads with LED power indicator. • Controllable full to 1/32 power levels. • Photo slaves and flash lamps can be replaced. • Takes Bowen’s style Softboxes, etc. The 21st Century Guide contains 250 exquisite full-color pages. • Vinyl backgrounds are a Superior thick 13 mil material for long-life. • Great high-key lighting with this smooth durable vinyl. • The BEST alternative to seamless paper lasting many years if kept properly. • Washes clean with soap and water. Call us Toll-Free if you need assistance on your shipping. 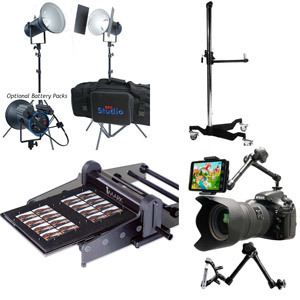 Since 1968, Pro Studio Supply has been providing photography supplies and photography equipment to amateur and professional photographers alike. 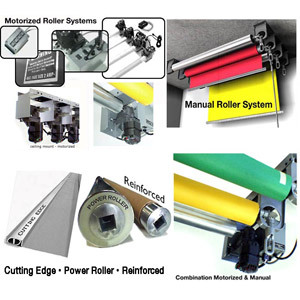 Our Most Cutting-Edge Serious Products include: LED Light Kits and Bulbs for Video and Photography, Photo Vinyl and Seamless Background Papers , Wallet Photo Die Cutters and Background Roller Systems for storing and holding backgrounds and related materials. So take your time and enjoy exploring our site! If there is something you are looking for, feel free to contact one of our professional team members at our toll free line. We will be happy to help you with all of your photography equipment and supply needs. We can also answer most technical photo questions about lighting or a posing challenges.